A quite nice, mild day, with no sun but no rain either. There must have been some overnight as the paths were damp, but it did at least mean I could get on with the last bits of the raised beds. First a trip to the wood yard to acquire more pieces. This time I was a bit more logical and got them to saw 3x2m lengths instead of 2x3m as then they fit in the car... Up to the plots and unpacked the wood to inside the gates, and then carried it all in a couple of goes up to plot 2. No stuck cars! The flower bed was a bit unprepossessing, loads of weeds, poppies, grass, and all quite soggy thanks to the overnight rain, so I started by evicting Jenny´s carpet out of the shed and putting it across the wilderness area. And it was just about the right size! Then went back to laying out all the pieces of wood and starting to measure out the bed (5.8m x 1m) Things then got a bit less daunting and so I had made a good start when Chris appeared, then went off to dig up at the top. Gradually worked my way across the plot, adding more sides and removing grass, then made one more levelled path. The width was enough to leave the surviving carnations up the middle of the bed (left), with plenty of room for other stuff up the sides. The end section (no carnations) was full of poppies but I was rather harsh and pulled them all. If it´s anything like last year, there´ll be loads more appearing! That area should do a couple of sweet pea pyramids. Assuming I remember to plant said peas! The new beds look really quite decent now, if you ignore the carpet pieces everywhere. I´m sure they´d look a lot nicer if there was just bare soil visible, but I´m not about to remove my weed suppression ! I don´t need to warm any of these up for early crops, so they can just stay there until I need to plant. It´s quite funny, looking at them, how I started rather Heath Robinson to use up the bits from the old frames and ended up with slightly more respectable looking joints! And I still have one large plank left - visible in the photo. This will do nicely for if I need to crawl across a bed to plant it. Weekend spent putting up propagation frames and then sowing leeks, cosmos and sweet peas for cutting and the bulbs that I forgot to plant in October. They will all wind up in the lottie. Hopefully nobody damaged anything during half term but I'm almost too scared to go up and look. I love starting the new year´s plantings, though given how cold it is, not sure how much will grow for a while. Also (finally!) received the Topper shallot bulbs this week, so popped those in modules too. They have gone outside, so I expect they´ll take a while to get going. Was a bit disappointed in my usual supplier - late in delivering and several of the bulbs were rather squashy. I wonder if it´s a consequence of them being bought out by a much bigger company who don´t care as much :-( Anyway, got 48 usable ones, so that ought to keep my pickling in business come the autumn. Also planted parsnips. I haven´t grown these before and everyone says they are beggars to germinate. 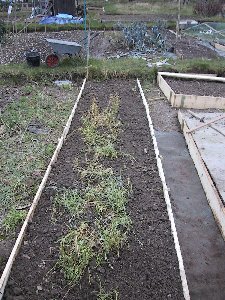 I´m following Julian´s advice and so have used compost-filled loo roll middles, sowing three seeds in the top of each one, and I hope I´ll get at least one germinating from each. Since it´s likely to be at least 3 weeks before I see anything, I´m not holding my breath! Day off, and frozen solid to start off. Finally plucked up the courage to go up to the allotment to see if it was still in one piece after half term. Fortunately it was - so did a bit of weeding (mostly in the orchard area) and had a chat to Vince about the plans for the year. Hopefully the working day on the 12th March will go well, and the open day this year will be July not August, so more people will be around to attend. Sprinkled some chicken pellets on the winter onions, since I'd read that they need a nitrogen boost more than the summer ones do. Pulled four leeks, though not the solitary one which is currently bolting: I might as well concentrate on getting the good ones in the freezer first! Also pulled more carrots: they have survived remarkably well, but not for much longer I suspect. I will clear that bed soon. It's going to get onions (HDRA trial if I succeed in getting it) and shallots, and thanks to all the compost I put into it, should be a nice texture. Also need to clear the cabbages, and the leeks are clearing themselves nicely. Peeked at the other beds - it's definitely that time of year for wanting to get cracking! At home, noticed that I've got a couple of the new leeks peeking through, though heaven knows it's been hard to germinate anything in the conservatory these past couple of incredibly cold weeks. The potatoes are still chitting happily, some are almost an inch long already. Mind you, have had them for a month already! No sign of the parsnips - they said >3 weeks and that was under non-arctic conditions - so far 16 days. Cabbages are next for sowing - due today or tomorrow. More snow late afternoon, so I´m glad I went up at lunchtime. Got painting the cold frame plant house with the orange paint that's on the shed. Might as well, since I've got gallons of the stuff. Just need some clear silicone sealant to go round the edges of the polycarbonate (and I'm going to do all of them, not just the ones that are loose, so that it's as warm as possible in there! ).